Japan took their imperious form from the individual categories into the first Mixed Team event at the Junior World Championships as they won gold on the last day of the competition. The scintillating mixed team event will be part of the Tokyo 2020 Olympic Games programme as countries see their best men and women link-up with national pride, international acclaim and silverware all at stake. 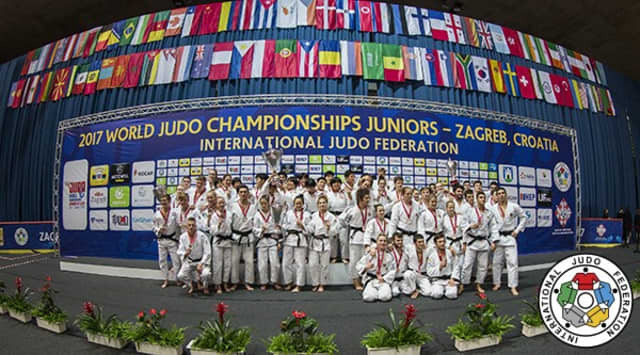 Russia won the first ever Mixed Team gold at the Cadet World Championships in August before Japan clinched the senior version in Budapest. The first Junior Mixed Team event featured eight judoka in a team (four men and four women) in the following weight categories: W -48kg, M -60kg, W -57kg, M -73kg, W -70kg, M -90kg, W +70 and M +90kg. 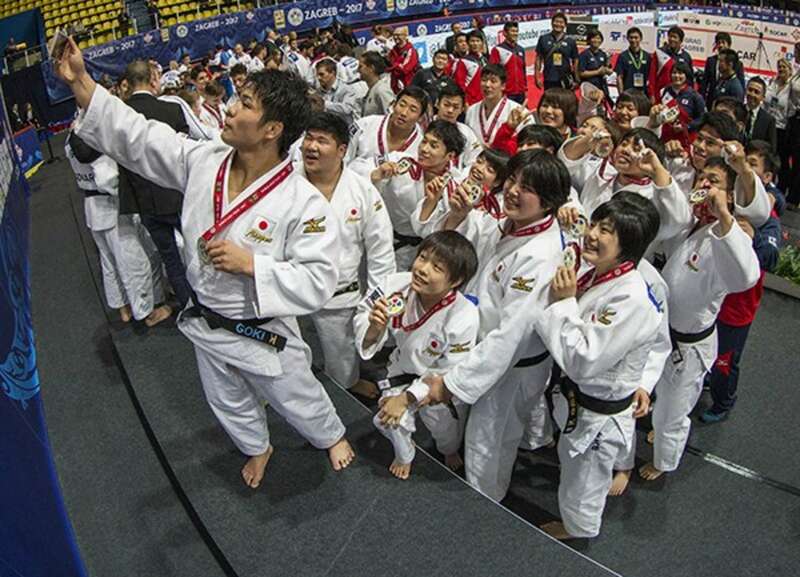 Japan overpowered the field of 16 teams to win the junior team title with a merciless display as they made sure that the Japanese anthem would be the only one played on the last day of the event. Japan's head coach INOUE Kosei said he was pleased with the team and individual results but that there was still room for improvement. "I am happy with the results and what I have seen here in Zagreb," said the Sydney 2000 Olympic champion and three-time world champion. "The women's team won six of the eight medals available but the men's team only won two gold medals. I hope they can show more in the future but today everybody did well in the team event. "The team event is very important for Japan, it is important to bring these titles back to Japan and to represent our country with pride and a strong performance. "We are now preparing for the Kodokan Cup 2017 which is a key domestic event and offers judoka the chance to earn a place at the Tokyo Grand Slam. From there, by winning a medal at the Tokyo Grand Slam, Japanese judoka will earn international selections for events such as the Paris Grand Slam and Dsseldorf Grand Prix." 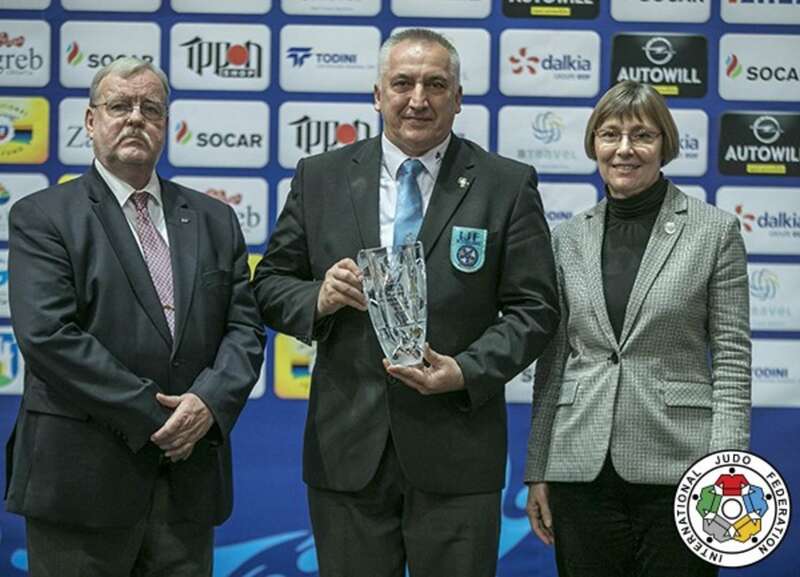 Croatian referee Anto PRGOMET from Pula was officiated for the last time on the world stage in Zagreb and was recognised for his contribution to judo with two awards. 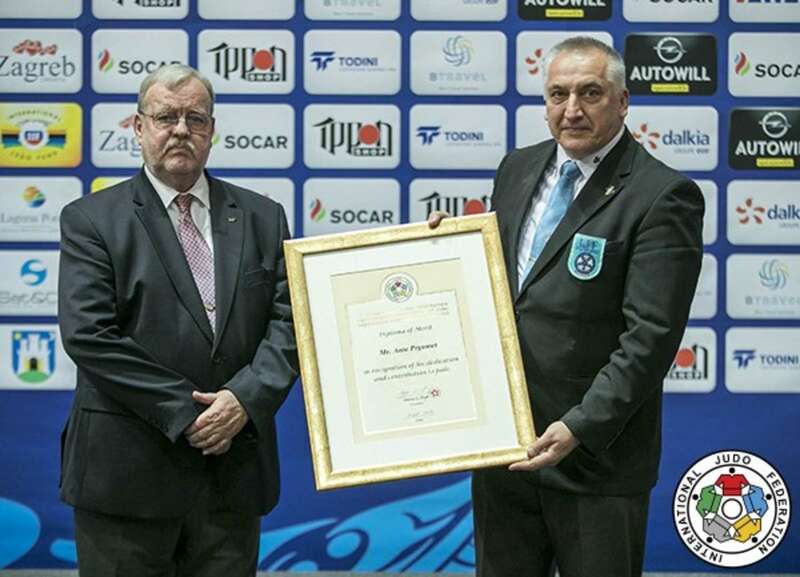 The long-time IJF A referee was presented with an IJF Diploma of Merit by Mr. Bernd ACHILLES (above - left), IJF Referee Director. Dr. Sanda CORAK (below - right), Croatian Judo Federation President, presented a specially engraved glass vase to PRGOMET who has controlled the action all over the world and at the IJF's World Judo Tour's showpiece events including multiple World Championships. The IJF World Judo Tour travels to the Middle East next week for the Abu Dhabi Grand Slam 2017. The last but one Grand Slam of the season has attracted the most star-studded line-up in the competition's history with double Olympic champion and nine-time world champion Teddy RINER (FRA). Fellow Olympic champions Paula PARETO (ARG) and Rafaela SILVA (BRA) will participate along with world champions Mayra AGUIAR (BRA) and DORJSUREN Sumiya (MGL). Japan defeated the Netherlands in convincing fashion to be crowned the first Junior World Championships Mixed Team champions. UMEKITA Mai (JPN) gave her country the lead by holding down Junior world champion Amber GERSJES (NED) and there was a sense that Japan would not let up and remain in control for the remainder of the match. Junior world bronze medallist KOGA Genki (JPN) doubled Japan's lead by defeating Tim BANEN (NED) by a waza-ari score. Junior world champion FUNAKUBO Haruka (JPN) beat Jorien VISSER (NED) for the second time this week to edge her team towards gold. 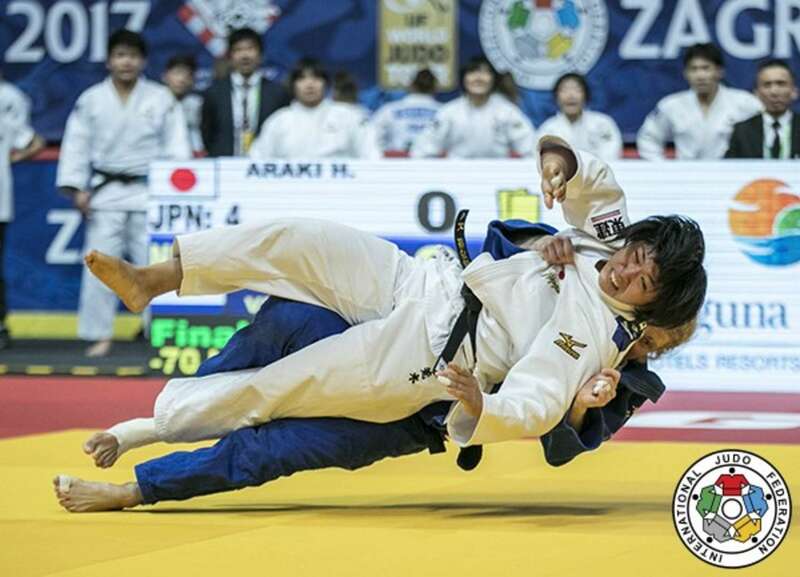 The Japanese had won their third round meeting in the individual competition by ippon and won again by the maximum score with a tate-shiho-gatame provind a third victory for the rampant favourites. ISHIGOOKA Hideyuki (JPN) was next up and he maintained the whitewash by besting Daan TEN HEUVEL (NED) who was drafted in purely for the team event. ISHIGOOKA held down the Dutchman for 20 seconds to put his country on the brink of winning gold. Junior world champion at -63kg, ARAKI Honoka (JPN), stepped up to the -70kg category to face Junior world silver medallist Sanne VERMEER (NED) and the latter salvaged a win for the Netherlands to keep the match alive. VERMEER countered a tame attack for ippon with 36 seconds left to put her team on the board and to give her colleagues a morsel of hope. 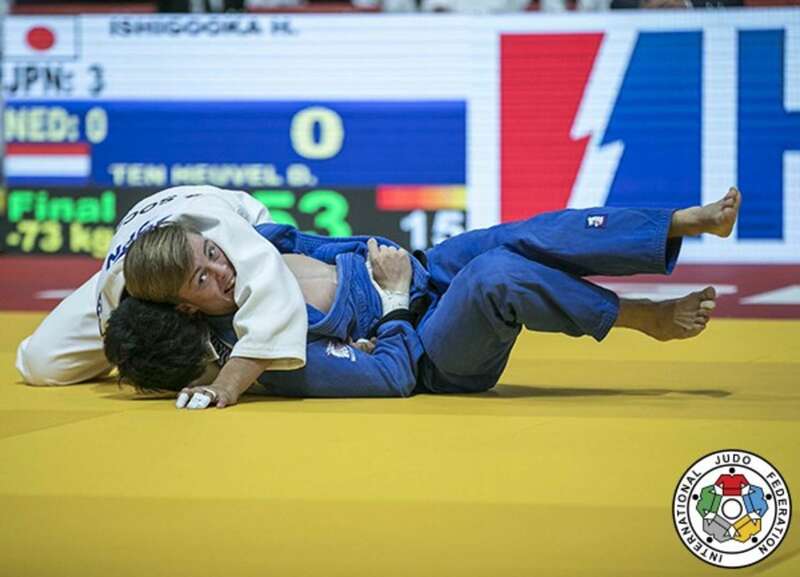 Junior world champion TAJIMA Goki (JPN) wrapped up the rout by defeating -81kg judoka Jesper SMINK (NED) by a waza-ari score. In the first semi-final Russia, who defeated Mongolia 5-1 in their quarter-final, faced Japan who had won every contest so far. Japan were dominant as they powered past Russia 5-1 to close in on the mixed world team title. In the second semi-final the Netherlands, who beat Uzbekistan 5-3, faced Germany who had defeated France by the same score. The first team bronze medals were won by Germany who defeated Kazakhstan 5-3 after an enthralling match. The second set of team bronze medals were won by Russia who beat Uzbekistan on points after each country won four contests. Russia finished with a vastly superior total of 40 points against 21 from their Asian opponents.